I’ve finally got a little down time since putting out another alpha build for Paint.NET v3.5 tonight (go get it! ), so I decided it was a good opportunity to update the usage statistics. The last time I posted an update was last October, and that’s way too long to have gone without an update. Overall, usage of Paint.NET is up by 9.2%. This is based on the total hits to the update manifest text files. The slow growth isn’t too surprising since there haven’t been any (stable/mainstream) updates to Paint.NET in awhile, and hence not a lot of news or blog posts to draw people to the website. That’s okay though, as version 3.5 is coming soon (more on that in a bit!). There aren’t too many changes in the demographics of Paint.NET users. Well, the number of French users has dropped from almost 8% down to 6.8%. Turkish has grown in popularity, jumping from 3% all the way up to 4.32% – an impressive relative increase of 44%. The thing I’m happiest about is the rapid increase of 64-bit Windows. 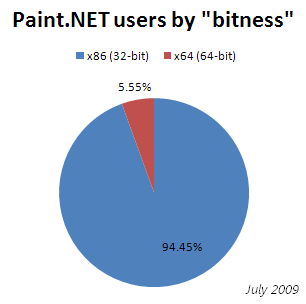 Last October, only 2.66% of Paint.NET users were on 64-bit, but now we’re up to 5.55%. That’s more than double! 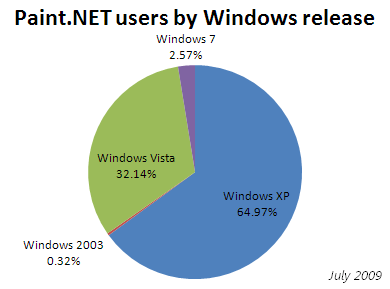 Windows XP’s share has dropped from 71.65 down to 65%, and Vista has increased slightly from 28% up to 32%. Windows 7 hasn’t even hit general availability and it’s already claiming 2.6% of the user base (which is very good!). I do not have numbers for which release of Windows 7 people are using (Beta vs. RC vs. RTW). Bold indicates a language that Paint.NET v3.36 includes a translation for. Very interestings stats. The S/W is very used. Hope MS will finally integrate it as a base program for Windows. 3.5 Alpha for Win 7 rocks. Keep it comin’ ! That lone Windows 2003 user is me. But, I primarily use it on Win 7 x64 (RC);. All the best!! Why? For the last eight years French users specially French schools have showed great interest on “free software” this on an effort to democratize software and make it available to anyone without the means to purchase expensive software. The Gimp had taken a big place in this project but very soon Paint.net made its appearance and gained great appeal because of all of its features. However, unlike the GIMP, developers do not have access to the code and can not participate in its development. These has caused many websites to drop Paint.net from their list of recommended software. For example: FRAMASOFT.NET. Nevertheless, Paint.net is the best alternative to Photoshop or the GIMP. Great work on the Latest PDN Release Rick. Dan, old brown bars? Huh? By Brown bars i mean the XP UI style for the menu bars, the ones that arnt the vista/7 style silver ones. Silver menu bar. Which is what PDN should have in my opinon. ‘Brown’ XP style menu bars on the My Computer page. which is the style PDN uses now, even on Vista/7 systems. Rick, I know this isn’t the best place to post this, but as I haven’t signed up for the forums I thought this was better than nothing. I think the latest build of v3.5 looks great, but it means that rolling over a lot of things – history, layers, effects/adjustments, etc. dropdowns, are a lot slower. Drawing and effect rendering work totally great and this is disappointing because PDN has always worked great on my system before. I’m running Vista on an HP Pavilion dv6000 if that helps. Otherwise, all of the updates have been awesome. Paint .net is the most powerful free alternative to Photoshop. KUDOS and awesome job. My request is on the visual side. Can we please work a little on the UI and try to make it look a little more intuitive ? I offer my knowledge and help in this field from wireframes to full interface with icons. Andy, just wait for my next blog post. Should be up soon! PDN is a great program. I use it exclusively. You can add to it easily. My ONLY complaint… is that it is only for Windows OSes. I am using Ubuntu 9.10… and I miss my PDN. Thank you all for this awesome program.